My kiddos love sweet potatoes (thankfully they take after mom and not dad). My husband on the other hand? I he could have Kraft mac and cheese for breakfast and lunch, followed by a frozen pizza for dinner, he’d be perfectly content. I’ll be sure to apply to be on the next season of Real Housewives of Husbands Who Are Pickier Than Your Toddlers. As a foodie, I take that as a challenge with pride to create recipes that he enjoys. And when he requests a tried-and-true Physical Kitchness meal instead of whipping out the freezer-burned pepperoni pizza?!? A million little angels dance in my head. I take full advantage of these requests, and bring my A game when cooking up a requested recipe. As he feasts I beam with food blogger joy with a win for the home team. Post meal, I might even Insta story a dancing reel with Queen’s “We are the Champions”. 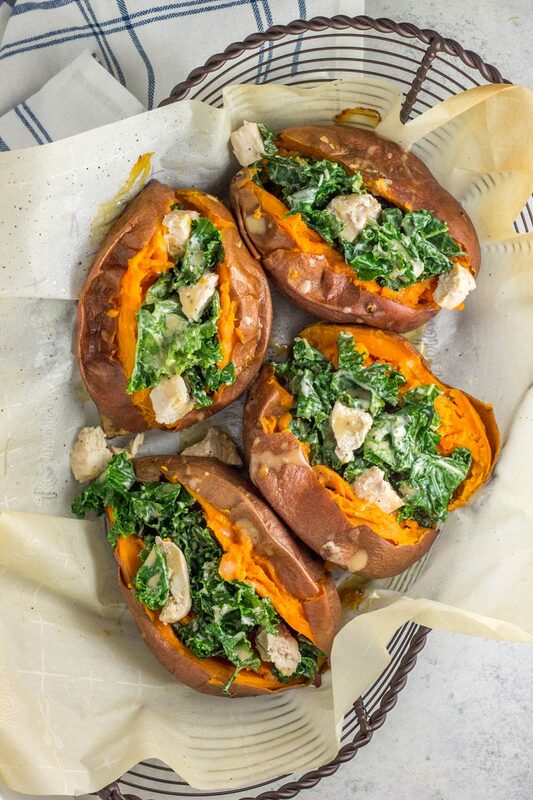 I am convinced that these warm kale & chicken caesar salad stuffed sweet potatoes will be next on his request list after trying. 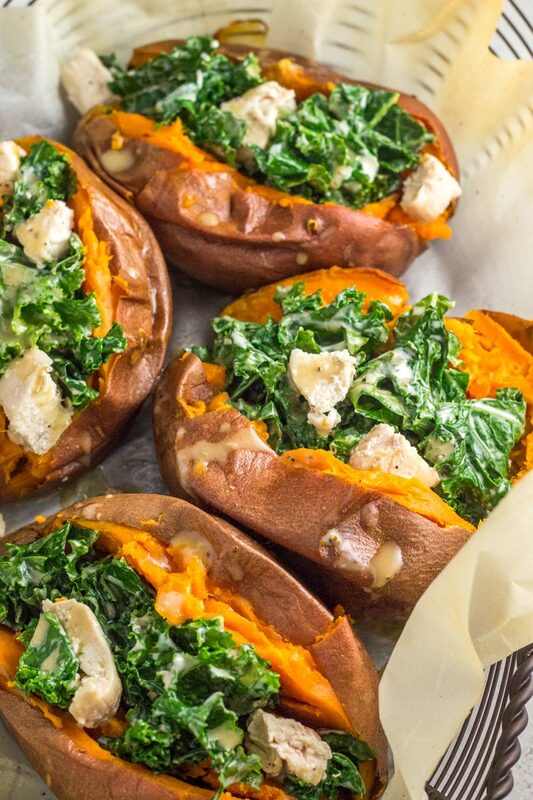 With a homemade caesar dressing tossed over warm kale and soft sweet potatoes, you’ll wanna snuggle up and eat every last bite of warmed goodness. 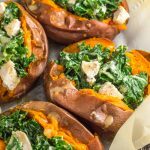 This warm kale & chicken caesar salad stuffed sweet potatoes recipe is a wonderful paleo and Whole30 compliant dinner. 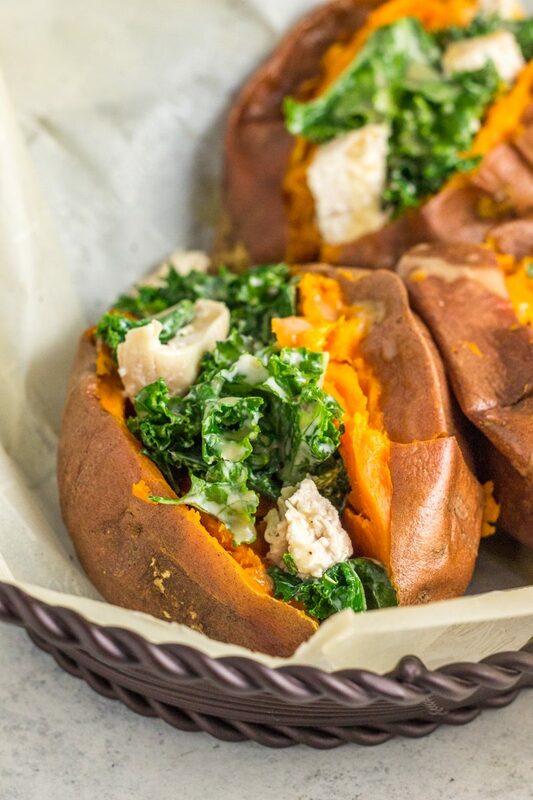 An added bonus is this healthy dinner is packed with vitamin c, beta-carotene from sweet potatoes, and vitamin a and k from the kale. Also, a perfect way to switch it up for the salad lovers, and perfect for non-salad lovers (husbands included). 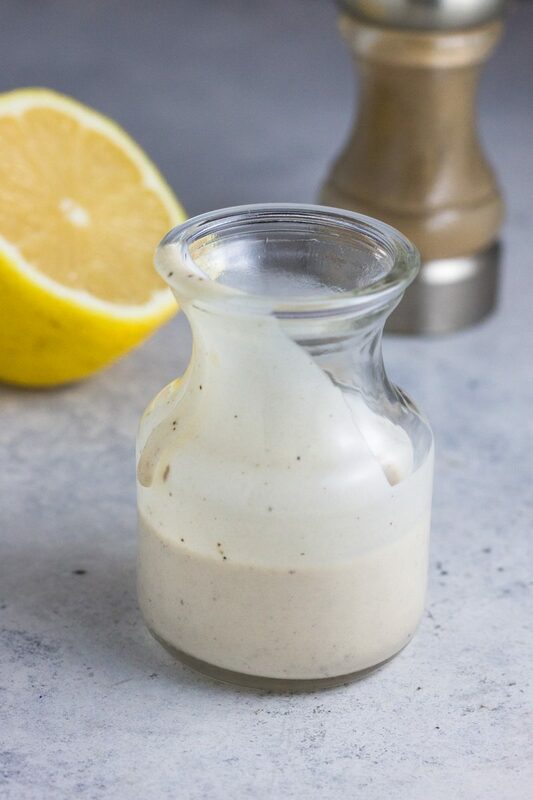 Make the squeaky clean homemade caesar dressing beforehand, so you can throw everything together for a quick meal with little prep! Save the leftover dressing to pair with other meals during the week. 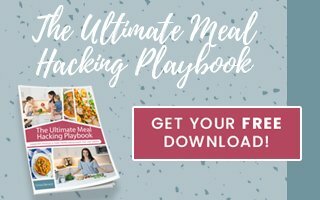 You can also make the chicken and/or sweet potatoes beforehand and simply reheat when ready to serve! 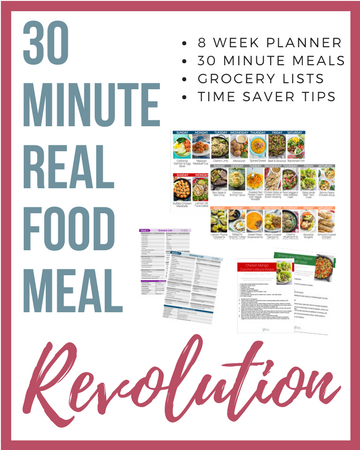 A paleo + Whole30 dinner perfect to feed a family. 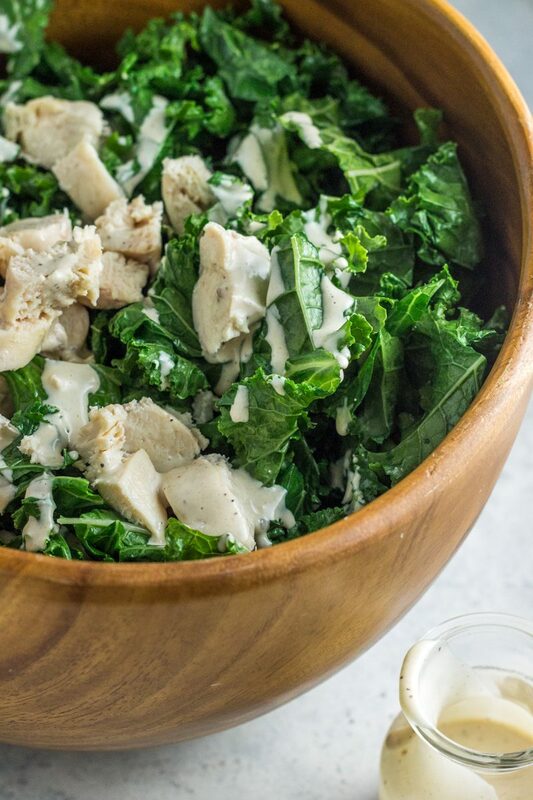 This homemade caesar dressing is amazing over sautéed kale and stuffed in savory sweet potatoes. Prep the dressing beforehand and store in the refrigerator until ready to assemble the meal. You can also cook the sweet potatoes and chicken beforehand to save on time, and simply reheat when ready to serve. Sounds delicious! Adding this to the rotation! Just curious if you could use anchovie paste instead of the actual anchovies. And if so, how much would you use? I bet this is super yummy subbing in your tahini dressing! Chicken tastes so good with that dressing!